Performs Rapid Home Provisioning operations and manages Rapid Home Provisioning Servers and Clients. rhpctl add                   Adds a resource, type or other entity. rhpctl addnode               Adds nodes or instances of specific resources. rhpctl addpdb                Adds a pluggable database to the specified multitenant container database. rhpctl allow                 Allows access to the image, series or image type. rhpctl collect               Collects backup of operating system configuration for the cluster. rhpctl compare               Compares operating system configurations for the specified cluster. rhpctl delete                Deletes a resource, type or other entity. rhpctl deleteimage           Deletes an image from a series. rhpctl deletenode            Deletes nodes or instances of specific resources. rhpctl deletepdb             Removes a pluggable database from the specified multitenant container database. 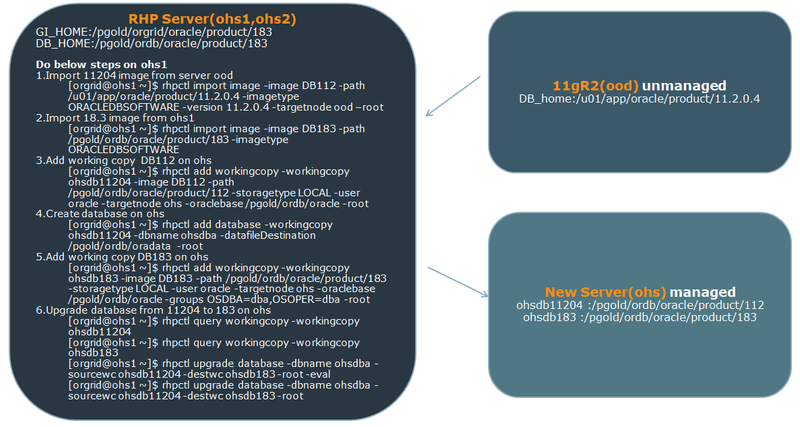 rhpctl deploy                Deploys OS image for the cluster. rhpctl disable               Disables the scheduled daily backup of operating system configuration for the cluster. rhpctl disallow              Disallows access to the image, series or image type. rhpctl discover              Validates and discovers parameters to generate a response file. rhpctl enable                Enables the scheduled daily backup of operating system configuration for the cluster. 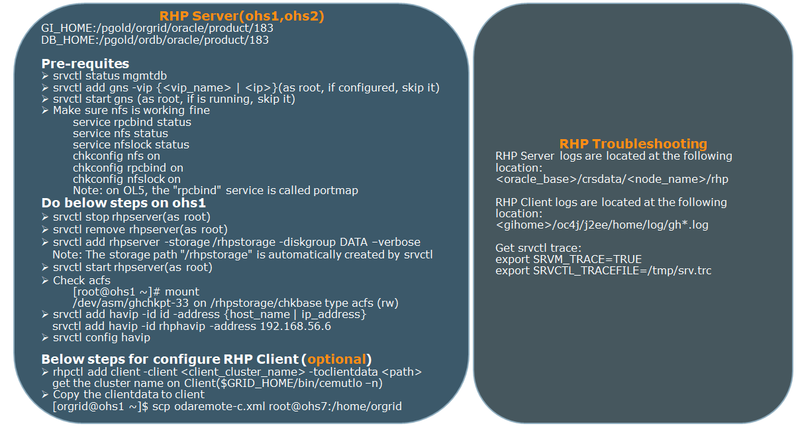 rhpctl export                Exports data from the repository to a client or server data file. rhpctl grant                 Grants a role to a client user. rhpctl import                Creates a new image from the specified path. rhpctl insertimage           Inserts a new image into a series. 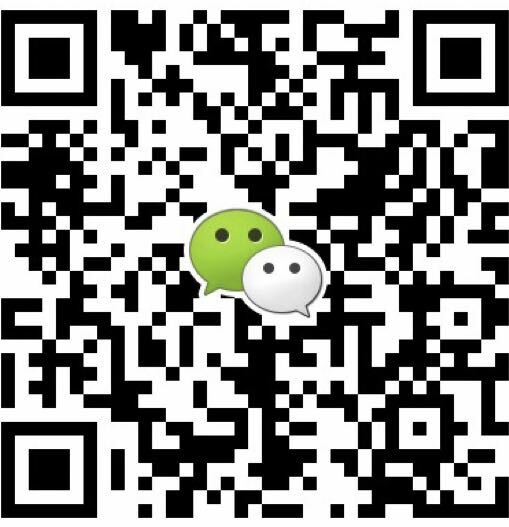 rhpctl instantiate           Requests images from another server. rhpctl modify                Modifies a resource, type or other entity. rhpctl move                  Moves a resource from a source path to a destination path. rhpctl promote               Promotes an image. rhpctl query                 Gets information of a resource, type or other entity. rhpctl recover               Recovers a node after its failure. rhpctl register              Registers an image, user or server. rhpctl replicate             Replicate image from server to a specified client. rhpctl revoke                Revokes a role of a client user. rhpctl subscribe             Subscribes the specified user to an image series. rhpctl uninstantiate         Stops updates for previously requested images from another server. rhpctl unregister            Unregisters an image, user or server. rhpctl unsubscribe           Unsubscribes the specified user to an image series. rhpctl upgrade               Upgrades a resource. rhpctl verify                Validates and creates or completes a response file. rhpctl zdtupgrade            Performs zero downtime upgrade of a database. 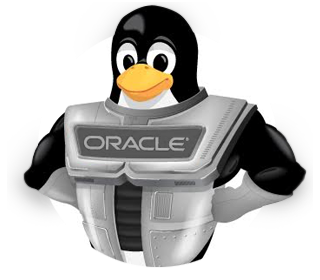 [oracle@sdb09] /home/oracle> sqlplus "/as sysdba"